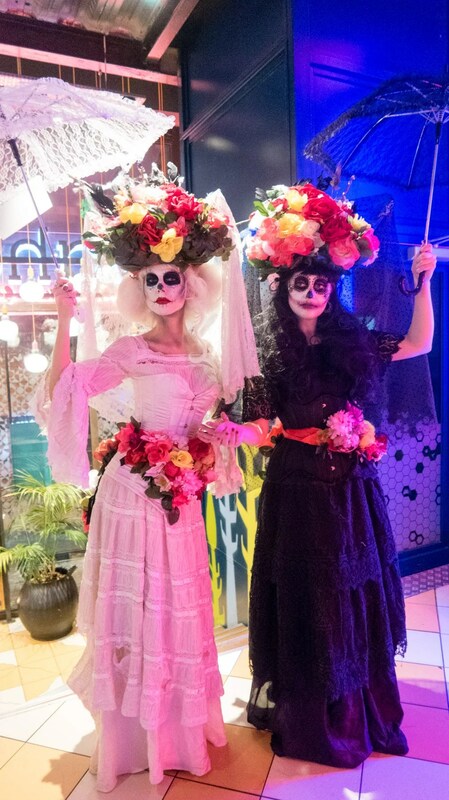 The restaurant was decorated to celebrate the festival, with brightly coloured flowers, an ofrenda (altar), bunting, live music and actors/actresses playing hosts from the land of the dead. The actors and actresses on the day were spectacular, keeping in their role and asking us what it’s like to be living. Some were stoic, but I assume they’ve been dead for a while. The evening was set up so that when you arrived, you would get your face painted so that you can then cross over to the land of the dead (the actual restaurant). We got a polaroid taken and these were put on our table when we arrived. Shown are the main menu and vegetarian menu for the day. As you can see, both are fairly similar with clever adjustments for the vegetarian versions. I chose to eat from the vegetarian menu on this occasion, in an effort to reduce my meat intake. Read how eating less meat and other actions can help combat climate change. Marigold Margarita was given to us on arrival. 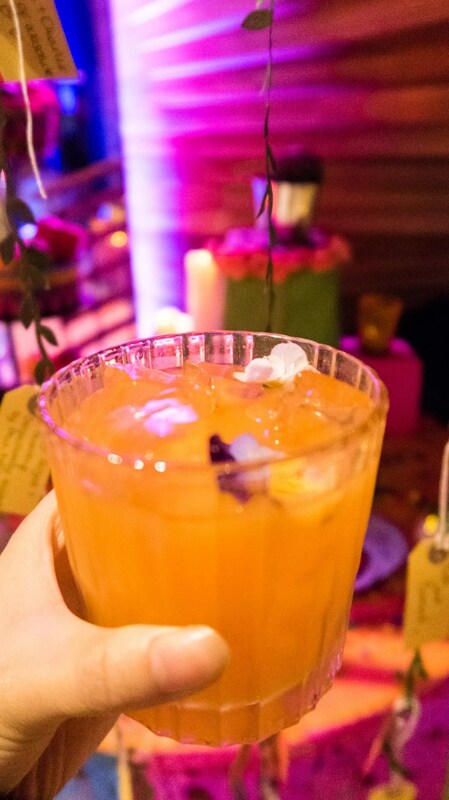 It contains Olmeca Altos tequila which is made from 100% blue agave in Mexico, Ancho Reyes, a spicy Mexican liqueur and topped with edible flowers. I admit I did not like this drink initially; it is not as sweet as the cocktails I tend to like. I continued to drink it and it did slowly grow on me and became pleasant. Next, we ordered the strawberry and basil daiquiri, which was definitely sweeter. The cocktail contained golden rum, winter spices and fresh lime. Don’t be put off the basil as it was very subtle in this drink. During the meal, a man came round the tables and spoke with passion about mezcal. 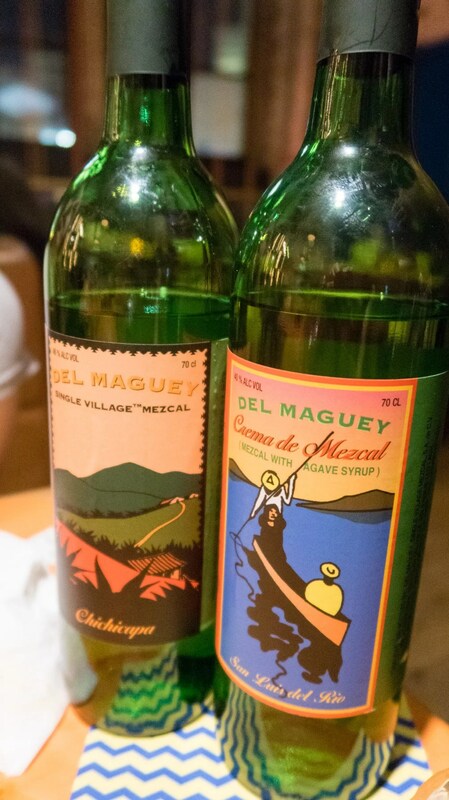 He had two types of Del Maguey mezcal, Chichicapa (46% alc vol) and San Luis Del Rio (40% alc vol). You are supposed to sip these. 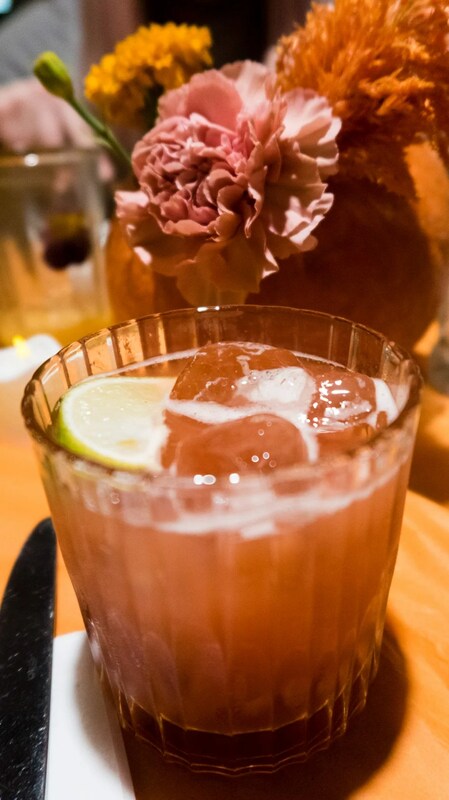 The unique flavours of mezcal can be appreciated more the more you drink. 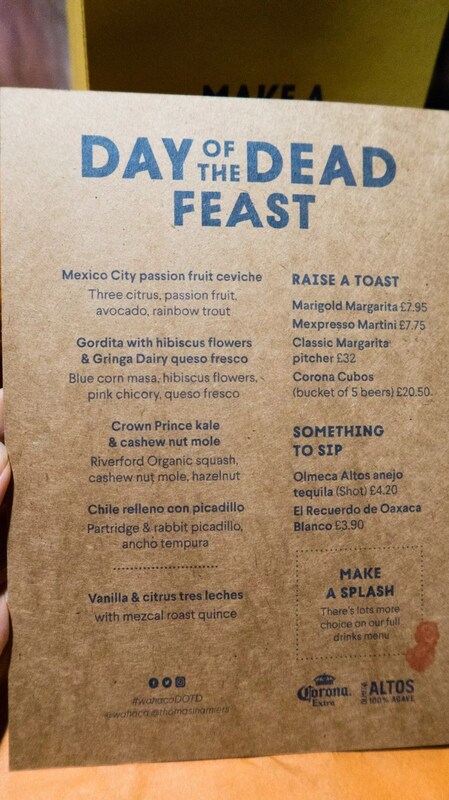 I can’t say these are my cup of tea as they were extremely smoky, but one to try from Wahaca. Three citrus, passionfruit, avocado and sauteed turnip. This is my favourite dish of the evening as the cerviche was really spicy and flavoured. All the flavours worked well together with a good acidity and a variety of textures. My only negative was that there was no indication that this dish would be as spicy as it was! Gordita (blue corn masa) is a Mexican type of bread made using corn flour. 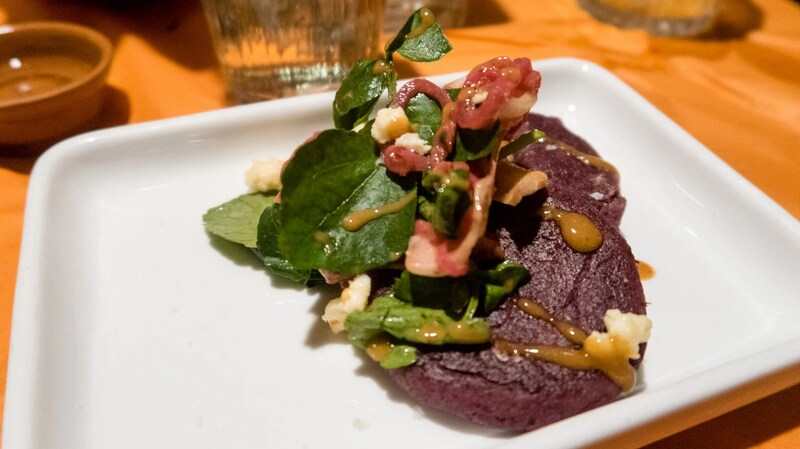 This was served with hibiscus flowers, pink chicory and queso fresco which is a type of cheese. I’ve never tried Gorditas beforehand; they are softer than I thought on first look but I still enjoyed them. The chicory added some texture and the cheese a salty depth. Overall, I liked this dish. Chargrilled Hispi cabbage, mole and salsa chile ancho. 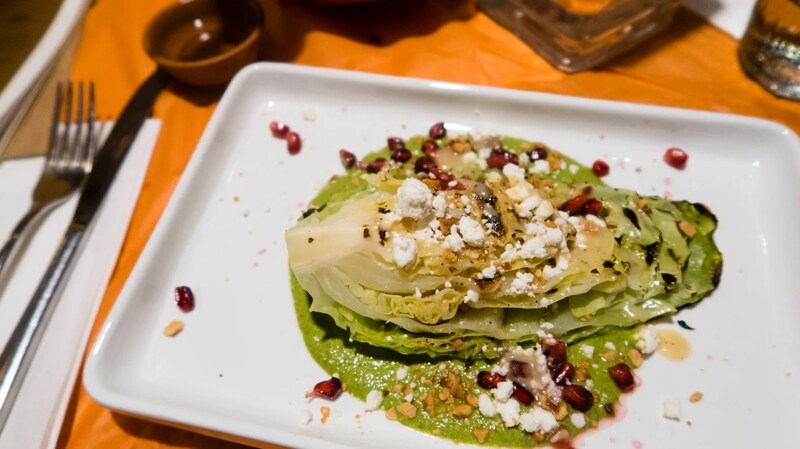 Serving a wedge of cabbage is definitely a statement to make, and one highly dependent on whether you like cabbage or not. Now, I don’t mind cabbage when it’s cooked well, and this one was. Mole is a type of Mexican sauce, and this kale and cashew one brought a much-needed moisture element to the dish. Topped with pomegranate for acidity and sweetness and cheese for saltiness. I think I would have liked an additional spice element to this, but overall this dish was well executed. 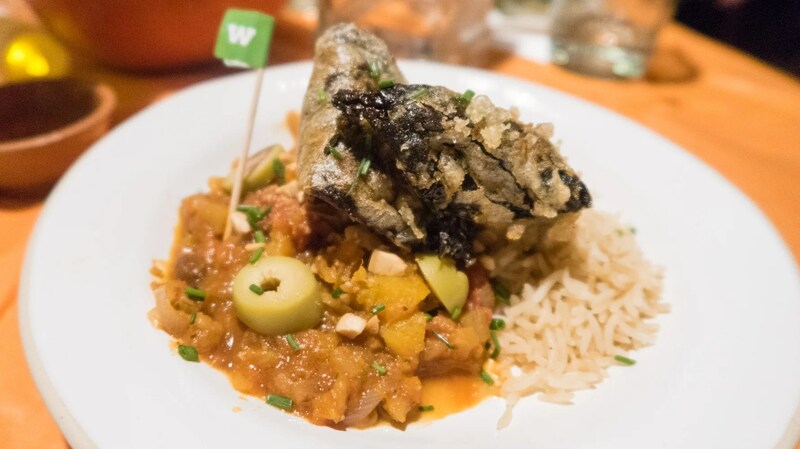 Organic Crown Prince squash with picadillo and ancho tempura. This is my second favourite dish of the evening as it tasted so hearty. A relleno usually is a chile pepper stuffed and then battered, so this wasn’t quite a relleno. Having said that, my favourite part of this dish was actually the ancho tempura as they had a good sweetness without being overpowering. The vanilla and custard tres leches was served with mezcal roast quince. By this point in the evening, I was feeling rather full so this may have affected my opinion of the dessert. 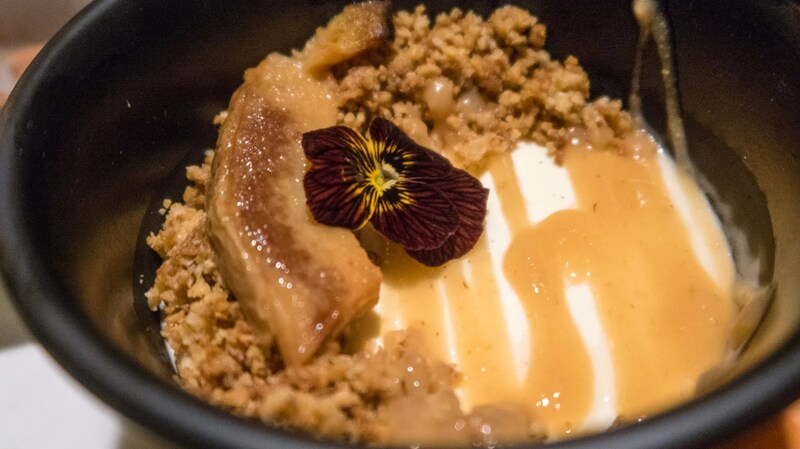 It was nice and I loved the crumble and the quince, but I felt there was far too much custard tres leche. 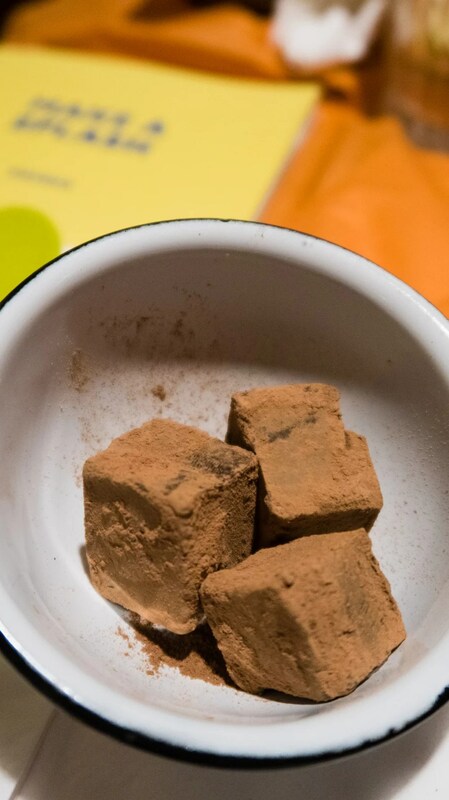 We were also served some blocks of chocolate which I really, really liked. 8.5/10, -o.5 on the naming of the relleno dish. A very minor issue. -1 on the lack of information about the festival. This I felt was the main issue I had with the day. Having done some prior reading, I did know some things, like how bright colours are used to represent the vivacity of life and that flowers, particularly marigolds are used to demonstrate the fragility of life. Such things I felt are important to know when you are trying to represent and inform another culture’s festival. I didn’t want to step into that dodgy realm of cultural appropriation where you are essentially taking something that’s not your own and making it something it is not. I felt there wasn’t enough done to inform. Some posters on the wall or leaflets at the table would have been sufficient. Having said that, the food was superb and the staff excellent throughout the evening. Yes. 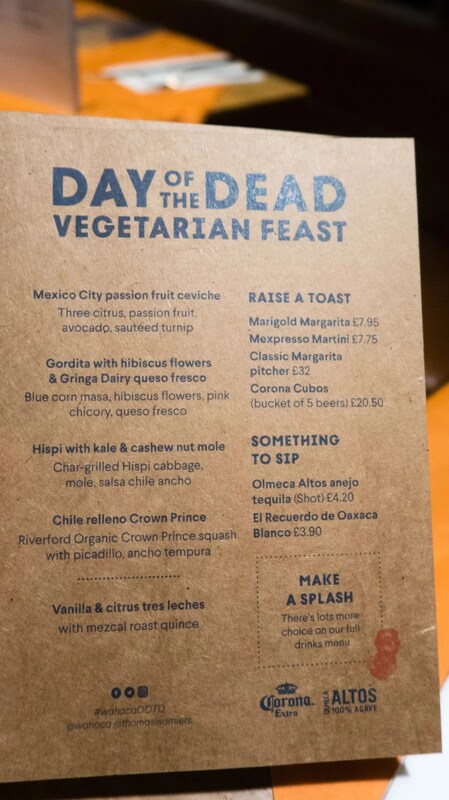 I think Wahaca do good food and they cater to a variety of dietary requirements too. 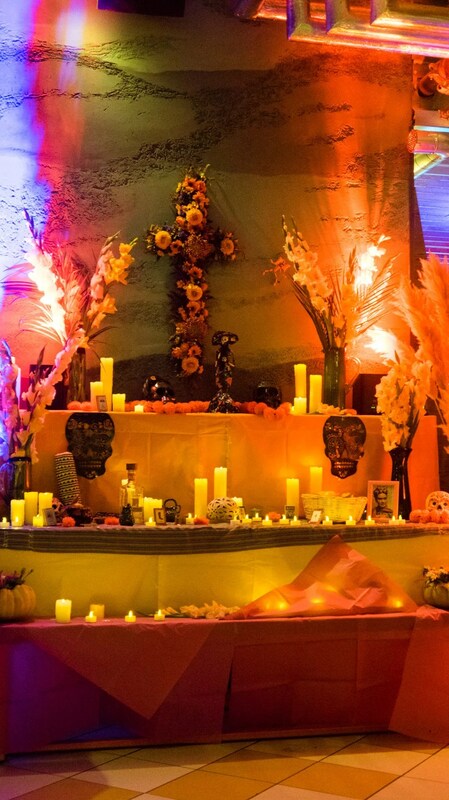 Have you heard of the Day of the Dead Festival? Do you like Mexican food? 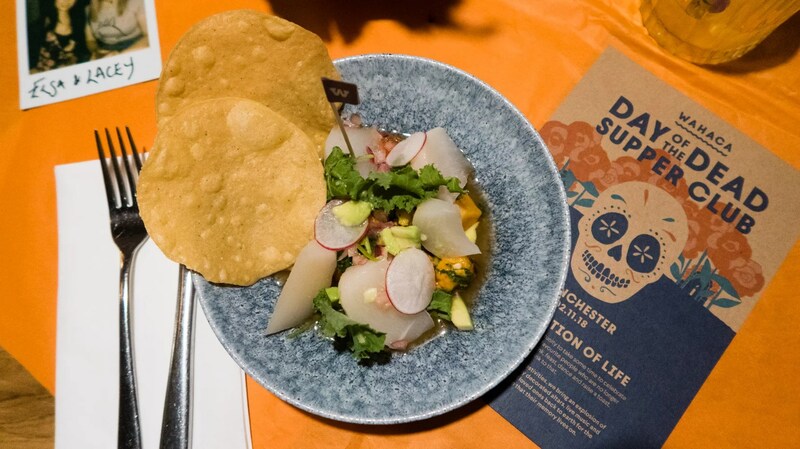 *I was invited to eat at Wahaca and did not have to pay for my meal. All opinion are my own.